Practice Area: Driving range with grass tees, large chipping/pitching area with sand bunker, and a putting green. 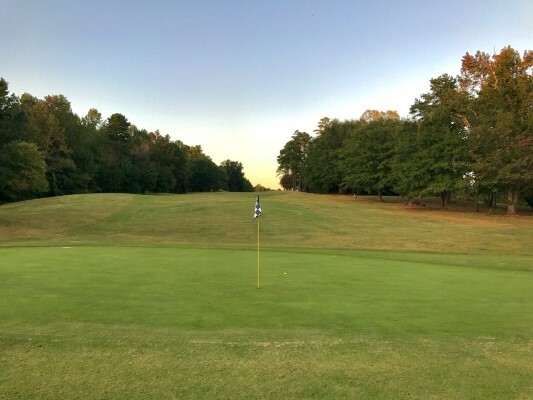 Description: This public course, formerly known as Renaissance Park, is located off I-77 near the old Charlotte Coliseum site and across from the Renaissance Park athletic complex. It's also across the street from a great practice facility (Leatherman's). 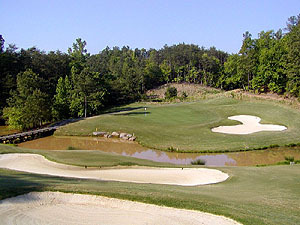 The layout features a wide variety of holes, several with elevated tees or greens. The back nine particularly feels like a mountain course as it winds through trees and streams. Notes: This course is now operated by Ratcliffe Golf Services (RGS), which offers a variety of affordable membership options that include 4 other courses -- Charles T. Myers and the beginner-friendly Revolution Park (9 hole), Sunset Hills and Paradise Valley (Par 3). B-Man's Take: I didn't play this course for several years, but recently went back (May '09). I had a few bad experiences with the conditions and hole closures here and was waiting for good feedback before I returned. It looks like Ratcliffe has gotten it mostly back in shape. The course is fun to play with all the elevation changes, especially on the back nine. It helps to know the layout because there are quite a few blind shots. The course plays long and has several tough required carries over water/marsh. One cool hole is the 220yd par 3 13th, with its elevated tee some 150 ft above the green. The toughest holes are probably the closing 3 - a 3 shot par 5 with an approach over a pond, then a sloping dogleft par 4 with the green down in a valley, and a blind tee shot par 4 with an approach guarded by another pond. In general, the conditions here (fairways, rough, greens) are just okay, but the layout is unique. 6/7/18 - I had a great chat with Del Ratcliffe this week about plans for all of his courses, including the Harry Jones course near Renaissance Park. Plans are not yet finalized but they have brought in Ron Garl (he designed the now closed Regent Park golf course) to consult on a likely redesign of all 18 holes. This municipal course has many holes built on the site of a former city landfill which presents many challenges for the maintenance and upkeep of good playing conditions. If the redesign proposal moves forward, the course would likely be closed for 18-24 months. This is one of the reasons Ratcliffe Golf Services is investing now in making improvements to their other courses -- Charles T Myers (new greens this summer), the Sifford Course at Revolution Park and Sunset Hills. I'll keep you posted as I hear more about the plans for this course.